A straight forward cake to make such as this one is ideal at Pesach, especially as it can be made in one bowl. 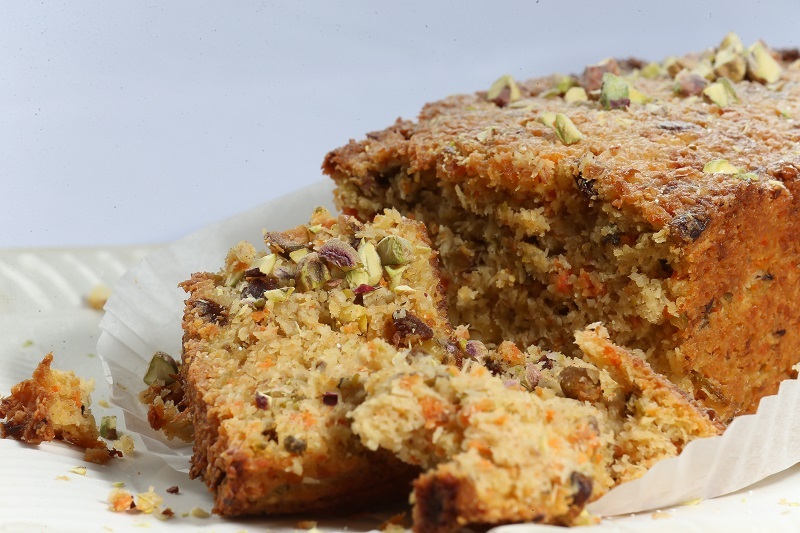 Carrots and pistachio nuts work well together to produce a moist cake that all the family will enjoy. Buying the pistachio nuts in their shells is a lot cheaper; although it is a little time consuming to shell them, it is well worth the effort. 1 Preheat the oven to 160ºC / 140ºC fan and line a 24cm springform cake tin with baking paper (enough to cover base and also sides). 2 In a mixing bowl, beat the eggs, sugar and vanilla together. 3 Then add the ground almonds, coconut, cinnamon and stir, before adding in the butter and giving the ingredients a thorough mix. 4 Add the grated carrots, pistachios and raisins and mix again until all ingredients are evenly incorporated and then gently pour the mixture into your cake tin. 5 Bake for one hour. 7 Decorate with sifted icing sugar and sliced pistachios before serving.